We would like to warn our customers of the existence of malicious websites that offer Buster Bros at very low rates solely for the purpose of retrieving your billing information. Very often these sites do not have a telephone number or postal address. For example the site Tropbelle is to avoid. If in doubt, do not hesitate to contact us. Can I find a Buster Bros model in a retail shop? Not so far. We opted for a direct internet sale in order to minimize the costs of the various intermediaries and to offer you the most accessible price. I received my ride-on and I noticed small defects of appearance, what to do? 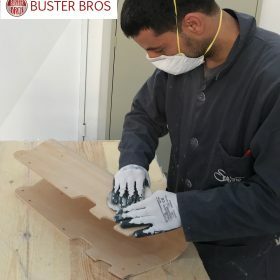 The Buster Bros is handcrafted with noble materials including the beech saddle, which is a living material. As a result, in some places, the paint may be cracked due to the natural work of the wood. On the other hand the metal parts are welded by hand and the work of the tubes can cause some scratches. For design reasons, the back plate is fixed to the saddle thickness and may therefore be fragile. If possible, protect it from shocks. The Buster T is available in 9 basic colors. Our customers will soon be able to order the carrier of their child in the color of their choice. IS THE CARRIER MADE IN FRANCE? The design of the Buster T wearer was made in France by Jean GAROIS. When is its manufacture made entirely abroad. Many manual operations are necessary to manufacture the Buster T.
THE CARRIER BUSTER T IS IT PLASTIC? The carrier is made of beech wood. True ball bearings allow fluidity in the handling of the Buster T. Some decorative elements are made of plastic. FROM WHAT AGE CAN THE BUSTER T BEARER BE USED? 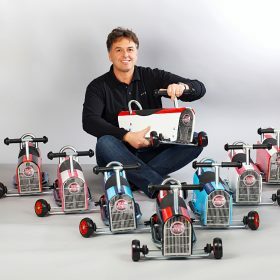 The Buster T Buster / Balance Bike is suitable for children from 1 to 3 years old. CAN I PERSONALIZE THE ELEMENTS OF MY CARRIER? You can first choose the color of your child carrier Buster T.
Optionally you can also customize the back plate of Buster T.
IS THE PRODUCT SUITABLE FOR MY CHILD? Little boy on white wooden carrier and red stripes. 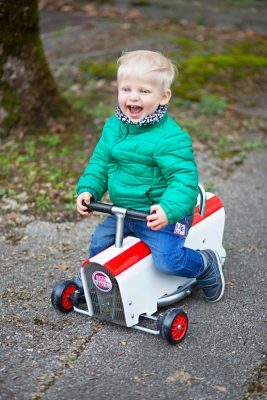 The Buster T carrier is suitable for children from 1 to 3 years old. The wearer complies with NF EN 71-2 + A1 (04/2014) – Safety of Toys – Flammability and NF EN 71-1 (12-2014) – Safety of Toys – Mechanical & Physical Properties. The chassis of the wooden carrier is guaranteed 10 years. Quels sont les coloris disponibles ? Le Buster T est disponible en 9 coloris de base. Nos clients vont pouvoir prochainement commander le porteur de leur enfant dans le coloris de leur choix.